Bud Abbott and Lou Costello, circa 1941. Abbott and Costello are perhaps the first comedians to have transcended time itself. Their movies, radio shows, and television appearances still have the power to move people to tears of laugher. To many in Hollywood, their rise singalled a sea-change in entertainment. Love 'em or hate 'em, they changed comedy forever. Bud Abbott was born into a family of circus performers, eventually becoming a producer of burlesque shows. Struggling and up against it, he began performing as straight man in the comedy acts when he couldn't afford to pay one. During this time, he bumped into Lou Costello, but they did not team up until 1935, when Costello's regular straightmen became ill.
Lou Cristillo was born to Italian parents. In school, he was a gifted athelete, becoming a hot-shot basketball player. As a boxer, he changed his name to Costello. Hooked on movies, he decided to move to Hollywood to become an actor, where he did some stunt work, but became discouraged. Stranded in Missouri, he begged a manager to let him perform at a burlesque house. He did a German accent and called himself "Dutch." Several years followed of Costello performing on the burlesque circuit. Formally partnering in 1936, Abbott and Costello began performing in burlesque and what was left of vaudeville — anything that had a stage. By 1938, they joined the cast of the Kate Smith Hour, which led to the pair starring in a Broadway musical The Streets of Paris (also starring newcomer Carmen Miranda), which opened in June, 1939. Abbott and Costello were signed up by Universal Pictures to appear in supporting roles in the film One Night in the Tropics (released in November, 1940), where they performed a short version of their immortal routine "Who's on First?" Their breakout film was Buck Privates (released in January, 1941), which became a monster hit. They followed that up with In the Navy (released in May, 1941), with Hold That Ghost following hard on its heels (released in August, 1941). They took to the air in Keep 'Em Flying (released in November, 1941). All of these films are credited with reviving the fortunes of Universal Pictures, with Abbott and Costello becoming the biggest box-office stars of the year with salaries to match. Being invited to Grauman's Chinese was scheduled for Monday, December 8, 1941. Despite the fact that the United States had entered World War II on the day of their Forecourt ceremony, the atmosphere was light that day, with Bud Abbott's daughter recalling years later that Bud felt the ceremony a tremendous honor. The U.S. had a job to do, and entertainers like Abbott and Costello helped greatly in the war effort. Other Abbott and Costello films include: Rio Rita (which played the Chinese in May, 1942), Pardon My Sarong (released in August, 1942), Who Done It? (released in November, 1942), Lost in a Harem (played the Chinese in January, 1945), The Time of Their Lives (released in August, 1946), Buck Privates Come Home (released in April, 1947), Abbott and Costello Meet Frankenstein (released in June, 1948) and Abbott and Costello Meet the Invisible Man (released in March, 1951). They hosted their own radio program, The Abbott and Costello Show on NBC from 1942 to 1947, and on ABC from 1947 to 1949. 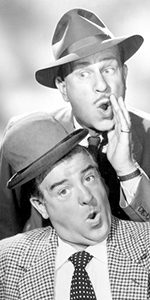 They became involved with the television show, The Colgate Comedy Hour on NBC from 1950 to 1955, and The Abbott and Costello Show in syndication from 1952 to 1954. Busy guys. But behind all the laughs, there were troubles. They squabbled over money and billing. They were both gamblers. They got in trouble with the IRS. Costello had health problems, exacerbated by the drowing of his infant son in 1943, which changed him considerably. Abbott was an epileptic, which he attempted to stave off with alcohol. Universal dropped them in 1955. Strapped for cash, the duo made Dance with Me, Henry for United Artists (released in December, in 1956), which flopped. They dissolved the partnership in 1957. Costello died of a heart attack in 1959. Abbott attempted to go on the road with a new partner, but commented "No one could ever live up to Lou." He did his voice for The Abbott and Costello Cartoon Show (which aired in syndication in 1967 to 1968). When Bud Abbott died at home of cancer at the age of 76, Groucho Marx commented, "he was the greatest straight man ever." Grauman's Chinese Theatre, Hollywood, California. 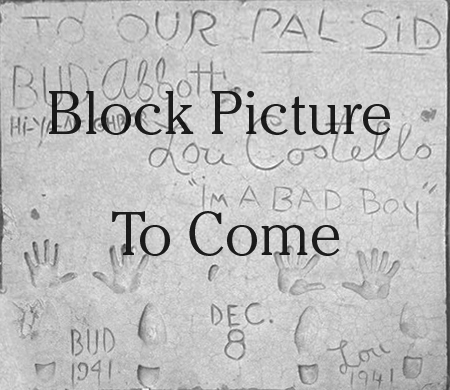 Bud Abbott and Lou Costello Forecourt ceremony, Monday, December 8, 1941. 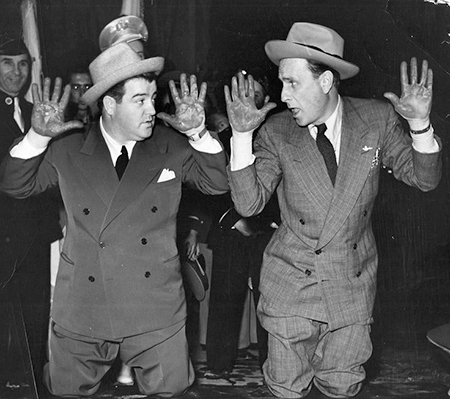 Lou Costello and Bud Abbott reach for the skies after making their handprints in the cement.